(This is a 2nd post for the day, please click HERE to check out my 1st post.) Hello there! 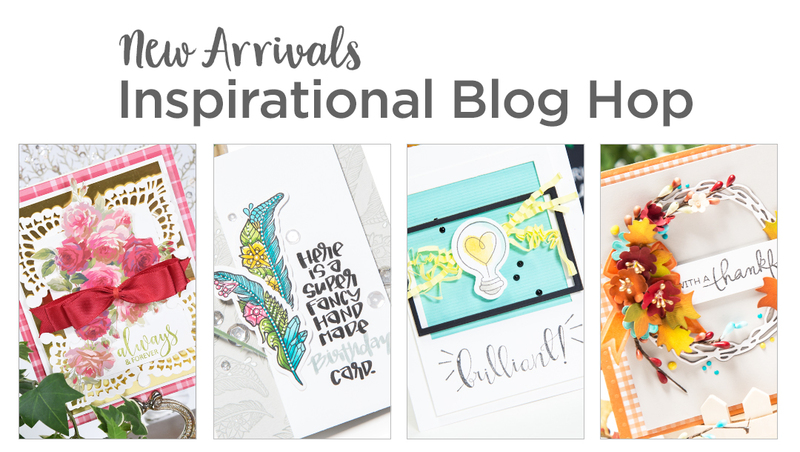 Welcome to a fun blog hop to celebrate Spellbinders’ new release! Lots of designers including me have so many projects to share with you all and hope you’ve been enjoying hopping along so far. If you came from Tiffany’s blog, you are on the right track! If you are just starting, no worries – you can just follow me along to make a full circle. Let’s dive into the project! One of the main reasons that I create cards is to brighten up someone’s day and let them know how important they are. I believe a bit of encouragement can really boost someone’s mood as well – and what better way to do so with a shiny, elegant card? I used two different stamp sets to create today’s card: the Feather Cool Vibes Set and the Light Shine Cool Vibes Set. Detailed feather images and the lovely sentiments truly make the card one of a kind. I wanted something bright to be the background of the card to help the gold embossed images pop – so I used the Broken Chian Distress Oxide Ink and the Cracked Pistachio Distress Oxide Ink and blended two colors onto a watercolor paper. After adding the color layers, I splattered clean water to let the oxidation happen – you can something super bright and bleached effect when working with them. The feather images were stamped in Embossing Ink and heat set with the Antique Gold Embossing Powder. I paired the card front with the Gold Foil cardstock to match the gold embossed image. The sentiment was stamped on a black cardstock and heat set with the Pure White Embossing Powder. I added a few of sequins near the sentiment to grab attention. The sentiment piece was cut using the Cascading Circles Etched Die. What do you think? Would this brighten up your day and give a bit of encouragement if you were to receive it? I hope you enjoyed today’s card – make sure to scroll down to enter the giveaway! You do not want to miss it! See below for all the products used in today’s project. I participate in several affiliate programs where I get a small commission at NO additional cost to you when products are purchased through links I share here. Thank you for your support! Spellbinders is giving away FIVE (yep, you read it correctly) $50 gift certificates to their online store! Make sure to visit their blog and leave a comment to win. I am giving away a $26 gift certificate to the Spellbinders store! Please leave me a comment below by November 26th, 11:59pm PST. I will post a winner here on the 27th. Good luck!! Congrats, Sandra! You are the lucky winner of the giveaway! 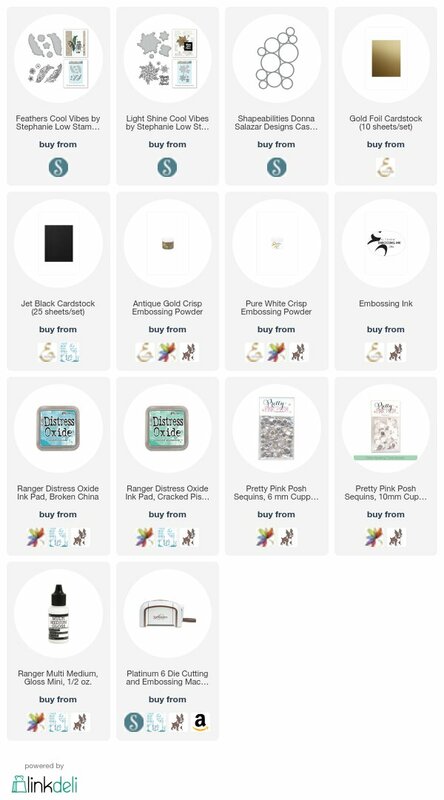 Please contact Spellbinders at socialmedia@spellbinders.us by the 11/30/2017 with the subject line “Spellbinders November 2017 Blog Hop Winner from Nicole’s Blog” to claim your prize! I am the last stop on the blog hop! But you can always start again from the top, with the Spellbinders blog. Please see below for full blog hop list. Love the elegance of the gold against the background. Beautiful! Pingback: It’s another Blog Hop! Gorgeous in gold 🙂 Such a lovely color combination! Great color combination for an awesome card! Thank you for sharing your creation with us. Your participation inspires us all. Love the gold feathers against your pretty blue background. Unique and so lovely. It would cheer me up and brighten my day to receive one like it. I like the all the texture on this card and the gold and blue color combination. oooo Love that background with gold! Love the colors and gold embossing!!! Love your card. It is very pretty. Thanks for sharing…. Adorable card using the new Spellbinders release! Beautiful card—certainly would brighten someone’s day. I love that cascading circles die. Very attractive color combination you used. The feathers look so elegant against the background. 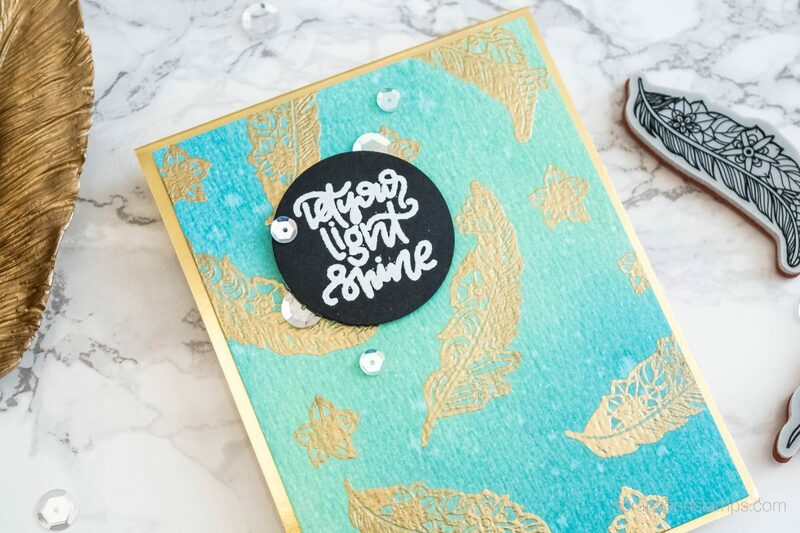 This is a fabulous November Release by Spellbinders. Very pretty inked background and I like the gold embossing. Feather, when embossed in gold, always seem to look quite elegant, and your card definitely shows that! Beautiful. Two of my favorite color combinations-gold and aqua! Thanks for being on the hop! this would totally brighten my day! lovely! Love the feathers and the colors you used! Beautiful background, love the gold with the blue and green! Beautiful card. Very nice end to a great blog hop! Those feathers are so beautiful. Love the background colours on your card combined with the gold. Love your work and color combo! Love the beautiful blended distress ink background and the gold embossed leaves. Just gorgeous! for me would be heart-warming. Thanks for sharing. The feather stamps makes such a lovely design. Love the beautiful cards you made. thans for sharing and thanks for the chance to win. Love the colors and embossing. Thanks for sharing. Love your card and TFS! Happy Thanksgiving! I love feathers! This is lovely! So pretty – love the gold embossed feathers. Love thet stamp and gorgeous embosing technique. Super card. Gorgeous card! I love the gold with the turquoise!! Gorgeous Card! Thank you for sharing your talents. Oh my goodness – I think aqua and gold is my new favorite color combo! This is just beautiful, Nicole. Oh, the feather card is beautiful! I love the gold and teal together. So pretty! Hi Nichole. Such a beautiful card today. I always enjoy your projects and learn many new techniques that inspire me to craft. Thank you so much! Such a beautiful card. I love the Distress Oxide colors you chose. This card would certainly brighten my day! Beautiful card. Love the background blending. The feathers are so beautiful embossed. 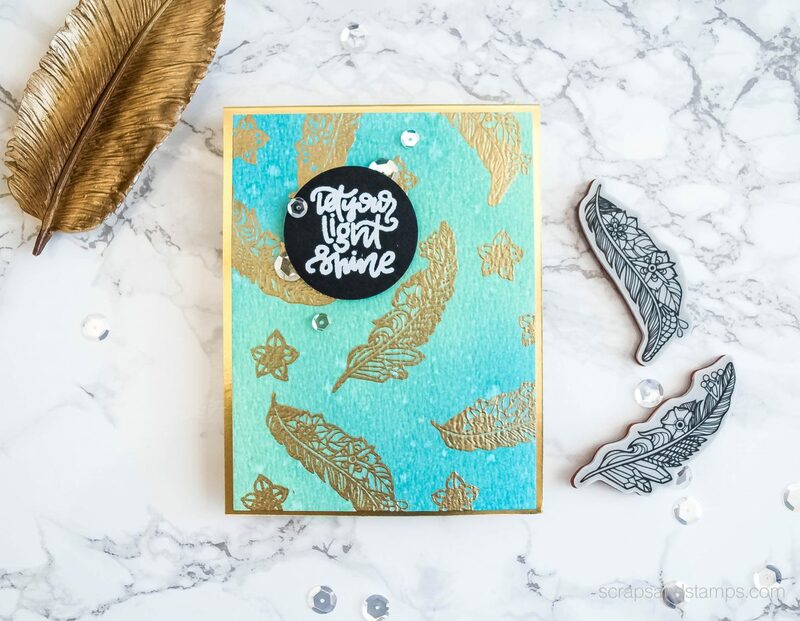 Yes, This would sure brighten my day Nichole, I love that gold embossing and the colors you picked for the background and especially the feathers, I am a feathers girl. I love collecting feather stamps, stickers, emblies, etc, Thanks. Your blended colors are so gorgeous. I think it’s sweet that I came here from Tiffany’s and your card reminds me of the Tiffany store! I have a serious crush on those feathers and done in gold – even moreso! Love that gorgeous background! This is an wonderful card ! love your card. the colors are so peaceful. 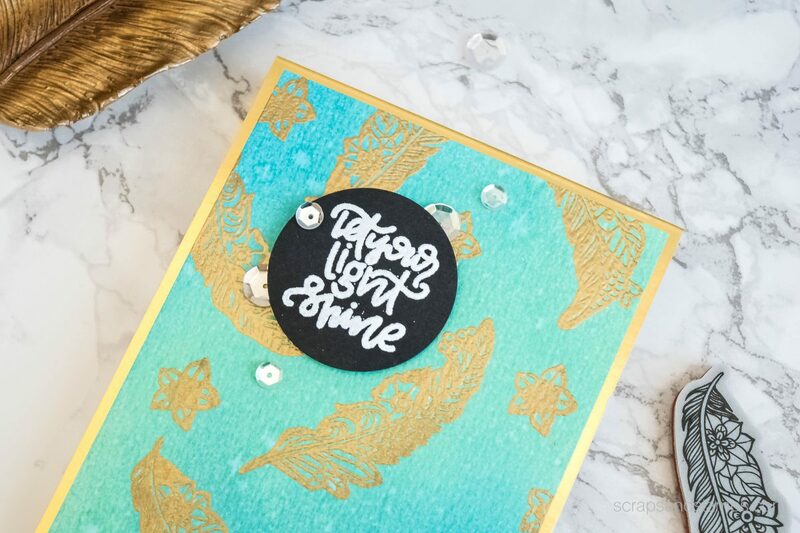 Turquoise and gold look so pretty together and give this card a trendy, modern look! Beautiful. I love the turquoise with the gold. Beautiful card! Love the colours. Wonderful coloring, I’d love to try these new markers! I especially love the lovely cluster of flowers that flow up the right side of the card! The feather stamps are so pretty embossed in gold.